About Program Director, Melissa Riley - I Dig Archaeology! The whole fiasco began when she was about 10 years old. A wide-eyed, impressionable young girl was given a rather unusual Christmas gift: a glossy, hard-cover edition of Brian Fagan's popular book "The Adventure of Archaeology". Over the next half a dozen years, Melissa spent long hours dreaming of dirty fingernails and mountains of pot sherds. Her love of archaeology eventually took her to the University of Sydney. She graduated with a B.A. (Hons class I) in 1999 after studying every form of archaeology known to humankind, and won an academic prize for her honours thesis documenting the history and archaeology of a Sheikh's palace in the UAE. Since then, Melissa has worked on numerous sites in Sydney, Cyprus and the Middle East as an archaeologist and heritage consultant. Nowadays, you can still occasionally see her skulking around archaeological sites in Sydney, trowel in hand (not that you can effectively skulk in a bright orange safety vest and hard-hat!). Melissa has dedicated her last fifteen years to promoting the study of archaeology in schools. 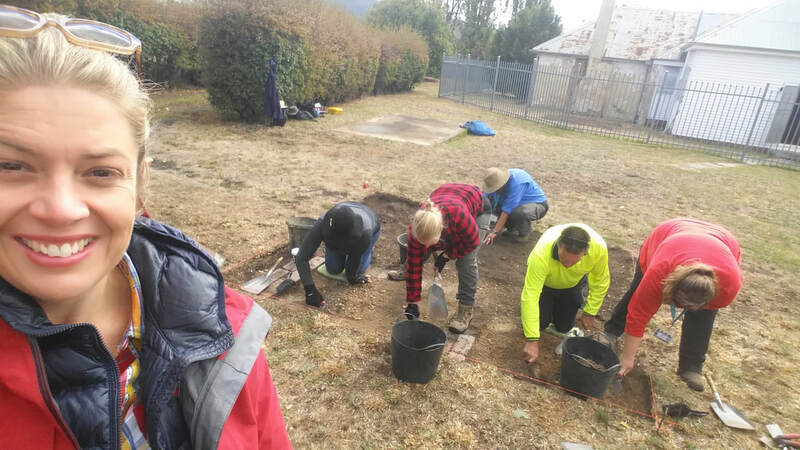 During and after the completion of a Graduate Diploma in Education from Macquarie University, she has worked as a high school History teacher, and as an archaeology educator for primary and secondary students with her "I Dig Archaeology!" education program. She has also completed post-graduate qualifications in gifted and talented education through the University of New South Wales, and is now embarking on a PhD examining the place of archaeology in the History classroom, specifically whether or not archaeological thinking influences History pedagogy and the impact of teacher professional learning in archaeology on classroom practice. "An archaeology program which maximises learning outcomes for students must combine sound pedagogy with the expertise, skill and knowledge from the field of professional archaeology," explains Melissa. "By combining these you ensure that the conditions are established for quality learning to take place, and that specific, high-quality knowledge is being shared. I've seen too many simulations degenerate into treasure hunts!! It's also really important that students understand that archaeology is a complex and technical profession that requires years of study and training, not something that is straightforward and easy and can be done with just a bit of basic experience. My program gives students a solid grounding in the knowledge of archaeological processes, without giving them delusions of grandeur." Melissa is also an active member of the professional community, both archaeological and teaching. She has published a number of academic journal articles and monographs, most recently contributing to a volume on teaching strategies in archaeology education. Melissa has also presented academic papers and workshops on archaeology education for the professional teaching community (through the AIS, the HTA NSW and the HTAA). Melissa is a member of the Australian Archaeological Association (AAA), Australasian Society for Historical Archaeology (ASHA) and the History Teachers Association of NSW (HTANSW). She is also an editor of the HTA NSW professional journal, Teaching History. A final word: "In the context of an archaeology-friendly Australian curriculum, it is vitally important that teachers and archaeology educators continue to deliver high quality, authentic learning experiences for students. Above all, learning should be fun, and we deliver that in spades (oops, no pun intended!)"